I loved drawing this, my biggest challenge so far!! wow. thts all i can say. ^^ wow. Amazing!! 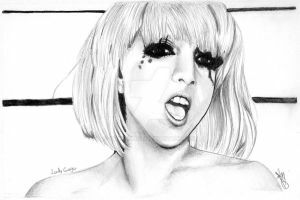 !the picture looks better than lady gaga in person!!! The pure beauty of this image is breathtaking. I LOVE the lace, what a job that must have been. I love how she's peeking out from under her hat. This is an instant fav for me. Wonderful work! Awwwwww ... you're very kind, thank you and thanks for faving too!! OH MY GOD OH MY GOD!!!!!!!! THIS IS AMAZING!!!!!!!!!!!! i luv luv luv luv luv it!!!! Ur so talented!!! wow good job with the lace especially! OMG!! so adding this to my favourites!! it looks just like her i love it! omg! fantastic!...how much time do you need to make something like this? 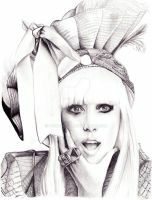 This is beautiful, you really did a great job capturing Lady Gaga in this drawing. i recomend water marks... artwork of this quality WILL be stolen! trust me, iv been there. I used to watermark my drawings, but I found if people wanted it, the waternark didn't deter them, so I stopped putting them on. However, I think I'll put them on from now on. lol its funny my stolen piece was a lady gaga portrait as well. Tho, not as good as yours ahaha. yourwelcome <3 keep up the good work and im sure a watermark wont stop people from wanting them just mention it in the comments!